Some would suggest that the twisted metal genius of the simple paper-clip is the greatest invention ever crafted. Imagine the civil service without such a piece of stationary – Whitehall would be awash with a destructive paper tornado akin to a hedgehog being let loose in a condom factory. Others would cite the warm glow of a light bulb as the culmination of human endeavour. No longer would ninjas be quite as successful in creeping around shadowy streets with a chloroform hanky at the ready to jump you. However, the greatest inventions are clearly those artefacts that build on previous concepts and make the original idea better. Case in point, take one well known holy trilogy and merge it with the building blocks of a child's imagination. Here's hoping the clever git that foresaw the winning combination of Star Wars and Lego was handsomely rewarded for his efforts. More so, let's hope the guy that said "let's make a computer game out of this" has been made King in the Halls of Valhalla and is being fed grapes by scantily glad valkyries with massive breasts for all of eternity for his singular contribution to gaming invention. In a galaxy far, far away Nazi poster boy Luke Skywalker is fed up of dusting crops and attempting to grow a poor man's mullet and wants to get in on the rebellion's action against Imperial might - namely, destroying a giant space station called the Death Star. Along the way he learns about the Force from Obi Wan and Yoda, befriends the likes of Han, Leia, Lando and Chewie, finds himself in far flung places such as the Mos Eisley cantina, the ice planet of Hoth, Cloud City and the forest moon of Endor, before duelling to the death against the pant-wettingly scary Darth Vadar in order to restore the legacy of the Jedi Knights and the Old Empire. Sounds like Star Wars, right? Now imagine that George Lucas' universe - all of the above and the other scenarios that frequent the original trilogy of A New Hope, Empire Strikes Back and Return of the Jedi - is imagined in nothing but Lego. Yes, just Lego! Having goose bumps is a perfectly normal reaction to such knowledge, because there really is little else cooler than an X-Wing fighter flying the trench run... IN LEGO! Or blasting a stormtrooper to death only for his body to fall apart at the hips... just like it would WITH LEGO! Lego Star Wars II does pretty much exactly the same as its predecessor (albeit without the ball-aching nonsense of Episodes 1, 2 and 3). Essentially a platform game viewed from a high 3D angle, the simple concept is to get your characters to the end of each scenario. This typically means leaping over pitfalls and traps, utilising the correct characters to solve puzzles, blasting your way through hordes of stormtroopers and confiscating a heavy duty AT-AT to make progress all the more easy. The game begins at the start of New Hope; on the rebel blockade runner legging it from a Star Destroyer, whereby you can immediately switch play between either Princess Leia or a rebel militant as you attempt to stowaway C-3P0 and R2-D2 in an escape pod. Once complete a couple of cut screens follow before you are thrown into the next scenario - Luke and Obi Wan rescuing the droids from the Jawa sandcrawler, giving you access to Obi Wan's force skills and lightsaber (which equals coolness to the power of ten). And so on and so forth. Sure, the scenarios are not deadly accurate to the movies plotting, but they feature enough that is reminiscent. The humorous cut screens provide comical reinterpretations of classic Star Wars scenes (Luke is portrayed as a bumbling simpleton which is ace) and are particularly useful if you've been hiding in a cave for the last thirty years and can't actually remember the plot of Star Wars. Additionally, whenever one of the movies large space battles occur the game switches from its platform roots to a more straightforward 3D shoot 'em up, involving dodging tie-fighters in the likes of the Millenium Falcon or an X-Wing. Two distinct types of level design certainly add diversity to the whole package. On first play though, Lego Star Wars II does seem stupidly easy to complete. Unsurprisingly, as a game mostly for younger children this means the difficulty level has been compromised. For instance, whilst an energy bar exists characters can never actually die. Death simply results in loosing Lego bits you’ve retrieved on the current level (more on those in a sec) and continuing onwards from the point you died. Within a few hours accomplished gamers are likely to have reached the end of Jedi shouting "yahoooooooooooooooo" as the Lego Falcon flies out of the Death Star avoiding the fiery flames of doom. So it's easy then? Well, only if you take the game to be a straightforward A to B exercise. Fortunately, there's much more going on than that. Once a scenario is complete the whole level opens up in a free play environment. Ledges that were previously out of reach and doors that were inaccessible with the characters provided can now be accessed in free play, leading to the reveal of whole new areas. Furthermore, whilst venturing around the 3D filled landscapes of both the main game and free play there are numerous things to collect. Red bricks, capsules and Lego bits all provide bonuses in game, as well as opening up even further game modes. 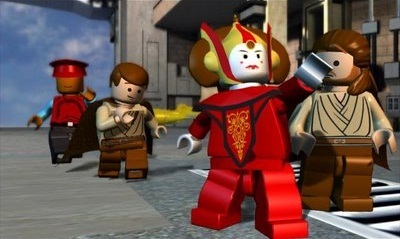 Additional time trials (such as completing the whole episode under a certain time), bonus levels and bounty hunter missions add to the longevity of the title, and the attempts to collect all the capsules that build the Lego vehicles parked outside Mos Eisley cantina as a players gallery will take some doing. And that's without mentioning the 50 characters that are available to unlock, including the mighty Boba Fett! Reaching that 100% complete figure will remain elusive for a while providing a good few months of play, and because it's the original trilogy players are much more likely to endure and stick with Lego Star Wars II, despite the initial simplicity. Especially when the game incorporates levels such as the speeder bike sequence from Jedi; bombing through the forest of Endor dodging trees and blowing the crap out of Stormtroopers is such splendid fun its easy to return and frequently play through such levels. Star Wars has always had that added hookability, and in knowing the characters and the set-pieces already, yet being able to participate in them again and again, goes a long way to putting the UMD disc back in the PSP. Indeed, Lego Star Wars II works amazingly well on the handheld format. Loading times are quick. The cute, cartoony nature of the graphics and the construction of the 3D environments are immediately attractive, and the controls are borderline simple. All the usual John Williams tracks are there included, ranging from the delightful din of the band playing in Mos Eisley's cantina, to the standout Star Wars anthem, to the darker Imperial March of later episodes. Everything that you'd want from a game emblazoned with the iconic title of Star Wars is there and fit for purpose on the smaller handheld system, and in some ways it's the perfect medium for playing the game. So, whilst the merging of Lego and Star Wars screams a great idea, its good to see that LucasArts have gone to the lengths of making Lego Star Wars II more than a mere novelty concept. For the age range the games targeted at its nigh on perfect, and despite the ease with which experienced gamers will breeze through the main scenarios, there has been enough thought placed into the additional game modes to make it a more worthy challenge in the long-term. And because it’s Star Wars, just in LEGO, for many it will be immediately accessible anyway, if only to play as Darth Vadar and force grip stormtroopers into tiny bits of Lego. Or to watch Leia slap Han whenever he accidentally hits her with a blaster. Or to hear the noise R2-D2 makes when he falls off a cliff. Genius! 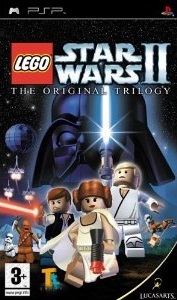 Lego Star Wars II, despite its slightly easy nature, is a perfect fusion of two brilliantly simple concepts and a very attractive proposition on the PSP.